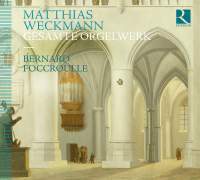 Recently, in 38:2, I reviewed another set of the organ works of Matthias Weckmann (1616/7–1674), performed by Friedhelm Flamme and issued by CPO as part of its ongoing series devoted to organ music of the North German Baroque. As I provided there details of Weckmann’s life and compositional style, and discussed three other competing sets besides Flamme’s, I will refer readers to that review for details. The upshot was that I endorsed as a first choice the version on the Loft label by Weckmann scholar Hans Davidsson (a three-CD set that includes a men’s choir singing verses of the hymns and canticles upon which Weckmann’s organ works are based), with Flamme placing a close second. This set does not alter that recommendation. While Foccroulle offers scrupulous and creditable performances, he falls short of both Davidsson and Flamme in the variety and imagination of registration necessary for this repertoire to have its fullest effect. As for how “complete” each set is (again, see the preceding review for details), this one includes five brief canzons for keyboard not found in the CPO set but included in the one by Loft. The recorded sound is clear, but again not as vivid as on the CPO and Loft issues. In sum, while the avid collector of competing editions will gain and not lose by acquiring this release, those desiring to have only one version should look to the aforementioned alternatives.